To the left is my daughter, Sally, holding her Comet J5 Cruiser. It was built sometime in the early 1990s, while we lived in Smithsburg, Maryland. This particular photo was taken quite a few years later when we were living in Loveland, Colorado. Below are photos of the model taken in early 2009. It has survived rather well for being at least 15 years old and for having made about five household moves. The tissue covering is a bit brittle from spending some time in the attic. No special building building techniques were used - just careful cutting, sanding , and gluing. Yellow Japanese (Jap) tissue was used for covering, with nitrate dope to attach the wet tissue to the frame, and then a 50/50 dope/thinner mixture for a few overall coats. Yes, that is a slight upward bow you see in the wings; it was not intentional, but would have been more trouble than it was worth to un-curve. One unique thing I did do was to hinge the rudder and elevator halves to make flight trimming easier. I used thin electrical solder as the hinges. Even though it is 60% lead, the amount is so small that the weight is negligible. It is easy to bend while being sturdy enough to hold the setting. Since the elevator halves are independent, rolling tendencies can easily be corrected. The Comet J-5 Cruiser flew fairly well, but was nothing stellar. I used four strands of 1/8 FAI tan rubber form Peck Polymers (yup, I still have a fair amount of it). The propeller also came from Peck Polymers. 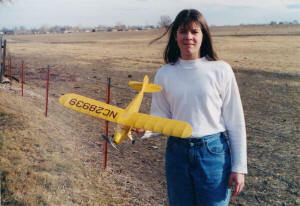 Click on the Comet J-5 Cub Cruiser kit box to see a really nice photos on the Small Flying Arts website of a J-5 being built and covered (the pictures have been removed).